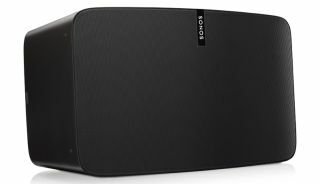 Sonos reveals new Play:5 speaker and Trueplay audio tuning | What Hi-Fi? The new Sonos Play:5 wireless speaker is a complete redesign, with a new style to better match the rest of the family, and new features to set it apart from its predecessor. The new Play:5 comes complete with Sonos' new Trueplay speaker tuning technology, which aims to perfect the sound based on your individual room conditions - and is set to be available for other Sonos speakers, too. There are now six (instead of five) drivers inside the Play:5, all of which have been designed afresh for this new speaker. On the outside the speaker now has touch sensitive buttons, a new plastic rather than metal grille and there are improvements to the wireless performance. The new Play:5 replaces the existing model and costs £429 - an increase in price compared to the 1st-gen Play:5, which went on sale for £349 (and is now available even cheaper). The new Play:5 has three orientations: you can place it horizontally as a standalone speaker, pair two Play:5s together horizonatally or pair two together and stand them vertically. You can also use them as rear speakers in a 5.1 Playbar setup for the first time too. Three mid-woofers and three tweeters have been designed especially for this speaker, with Sonos promising clearer treble, deeper bass and a wider soundstage. Sonos is keen to stress the attention to detail on the new speaker, right down to the precise placement of nearly 60,000 individually drilled holes on the new grille. Also new are touch controls - the first Sonos product to have touch sensitive buttons. This means tapping to play, pause and change volume, with a swipe gesture to change track. Built-in sensors ensure the touch buttons are the right way up regardless of whether it's horizontal or vertical. The other big news from Sonos is Trueplay, new tuning software that promises to get your Sonos speakers sounding their best no matter where you listen to them. Launching on the new Play:5, the room tuning system will also be available for the Play:1, Play:3 and the original Play:5, provided you're using an iOS controller. The aim is to tune your speaker to your room using the microphone on an iPhone or iPad. Your Sonos speaker will emit a test tone and the app will analyse the results before adjusting your speaker's sound accordingly. It's not available for Android devices yet, though Android users need only lay their hands on an iOS device to run the set-up, after which you can then revert to an Android controller. The new Sonos Play:5 is set for release later this year in special matte black and matte white finishes, and will cost £429.